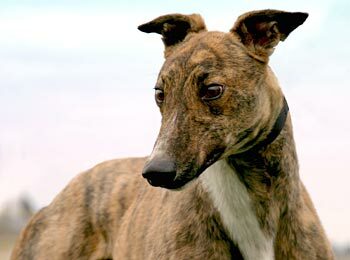 Sportster is a handsome, 2½-year-old brindle male born September 18, 2007. His sire is the Irish-bred Maryville Rumble, and his dam is Maritime. 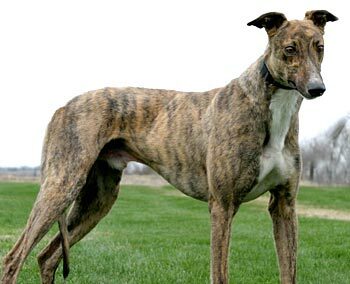 Sportster had absolutely no desire to establish a career in the racing arena, so here he is, ready to find his forever home! Sportster is cat tolerant, but has not yet been tested with small animals. Sportster is a big, sweet hound that will have you grinning a lot. He loves to sleep on his back. With his head to one side, his tongue hangs out while he’s sleeping. If he rolls onto his other side, his tongue is still hanging out on top! He’s also playful when he’s awake. Sport gets along greyt with his foster siblings, and is doing pretty good with the cats. He’s VERY full of energy in the morning and occasionally forgets his manners with the cats, but the rest of the day, he ignores them. He eats in his crate so he won’t plunder the other dogs’ bowls, then he spends some time in there afterward. He’s learning “good things come to dogs in their crate.” At his previous foster home he destroyed a crate and we feared he might hurt himself trying to escape from the new crate. So far, this less stressful and motivated crate training is working nicely. Otherwise, he does have a doggy door so he can go outside as he needs. Sport sleeps on a dog bed in the bedroom with his entire canine and human foster family at night. He awakens me in the morning by nosing me for some TLC. Come meet this fun, affectionate and handsome goofball and see if he’s THE greyhound for you!